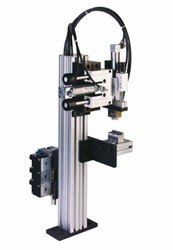 Pick and place automation systems are often part of a larger automated assembly system. These pick and place systems typically pick up components and place them into the fixture for the assembly process, or they are used to pull components off of the system and position them for packaging or for sending them to the next stage in the assembly process. Pick and place automation systems help maximize the efficiency of any automated assembly system by reducing labor costs and increasing production throughput. Dial-X Automated Equipment, Inc. has the experience and flexibility to meet your exact pick and place system needs. For further information or a free quote on pick and place automation systems, contact Dial-X Automated Equipment, Inc.